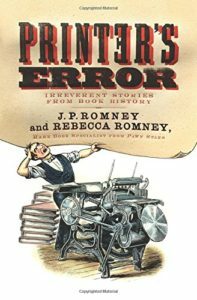 The John Russell Bartlett Society is thrilled to welcome Rebecca Romney, co-author of Printer’s Error, bookseller, and the History Channel’s Pawn Stars’ rare book expert, as our speaker for the 2017 Annual Meeting on May 24, 6 pm at the Aldrich House, 110 Benevolent St., Providence, RI. Co-sponsored by the Rhode Island Historical Society. How the artist and poet William Blake learned a new engraving technique from dream conversations with his dead brother. How Ben Franklin systematically destroyed the business of a fellow printer – a printer who earlier had broken up Franklin’s engagement by telling the prospective bride’s parents that printing was not profitable. How the first Gutenberg Bible was brought to America entirely by accident, much to the dismay of its new owner. How publishers learned that certain words in a book’s title can help sales. Rebecca Romney was born in Idaho, where she grew up reading everything from ancient Roman history to science fiction. She rebelled against her family of scientists by pursuing a degree in linguistics and classics in college. 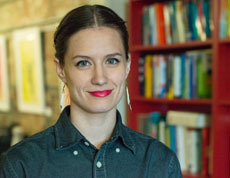 After a year teaching English in Japan, Rebecca helped launch the Las Vegas gallery of Bauman Rare Books in 2008, and became manager of the gallery two years later, eventually moving to Philadelphia to manage the central operations of the firm. Since 2011, she has appeared regularly as the rare book expert on the History Channel’s hit Pawn Stars. Now settled on the East Coast, Rebecca hosts the popular podcast Biblioclast, and has just completed an anecdotal history of printed books entitled Printers’ Error, published March 2017 by Harper Collins. She joined Honey & Wax Booksellers in the summer of 2016. Rebecca is a member of the Philobiblon Club, the Society for the History of Authorship, Reading, and Publishing (SHARP), the American Printing History Association (APHA), and a graduate of the Colorado Antiquarian Book Seminar and Rare Book School.